The last Monday evening of March (25/3/19) saw the culmination of months of speech-writing and rehearsing ready for the Gabblers after dinner speaking competition in Bristol for Year 12 students. 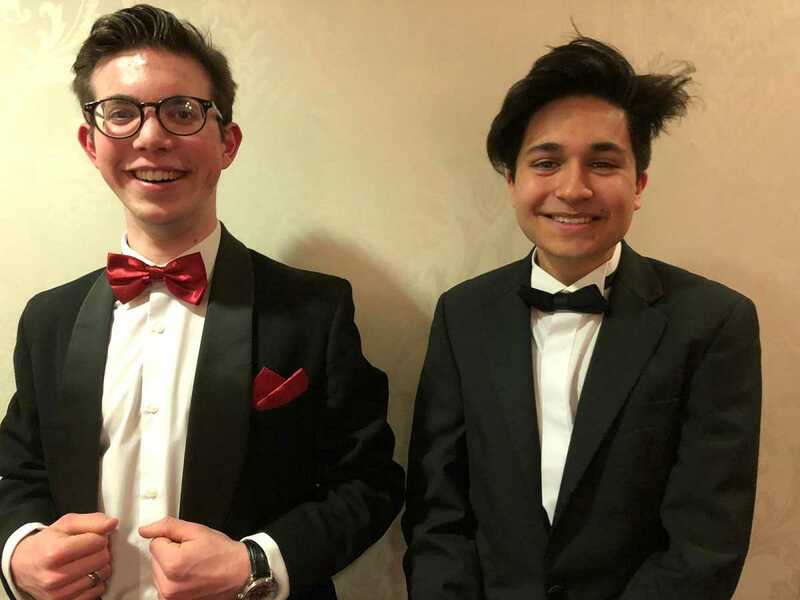 20 students took part from schools from within the Bristol locality and Year 12 students Aiden Malik and Isaac McAndrew were the Kings’ speechmakers with their (allocated) cunning titles, “Buying Time” and “Flotsam and Jetsam” (respectively). Places for Gabblers are hotly coveted, and to apply for their place, way back in September, Aiden and Isaac had a testing two-minute speech-off in the Kings Café which Isaac won. But another place became available and Aiden was quick to say yes! True to the art of after dinner speaking, the speakers and guests feasted on a meal at The Bristol Hotel before one by one they were up to give their speech. This was the most challenging part. The getting up and speaking. Mindful of the audience of parents, teachers and local dignitaries listening to so many speeches after a three-course dinner, there was a break halfway with a few jokes and a story, before the final 10 speeches. Previous Gabbler winners also provided some light entertainment. On the night of the final Aiden did particularly well in his speech “Buying Time,” in which he shared some clever and amusing anecdotes from his younger years and more recently about a watch he was buying at a discount and whether this was saving time or buying time he did not spend. For his speech on “Flotsam and Jetsam,” Isaac undertook lots of research into marine laws still in effect since the 1700s and incorporated a historical fact and a moral message at the end. Isaac also shared the meaning within his Dad’s household as a boy growing up in a big family of nine, in which the rule was that if you got up to do something your seat was up for grabs. At the end of the 20 speeches, the judges totted up the points and Aiden was delighted to be awarded second place on the evening, which won him a free night at The Bristol Hotel. Good job he was wearing his now very lucky Homer Simpson socks. Aiden feels particularly pleased with his triumph as he studies Maths-based A Level subjects; whereas most of the other speakers (including Isaac) study History and English Language/Literature. Aiden and Isaac would recommend any students thinking about applying for Gabblers and interested in the speech-writing process to draft it in advance - and not on the night (as one fellow student allegedly did this year). To get people to listen to the speech in advance, even if they only suggest a small tweak and to ensure speakers of the future know their focus and an awareness of the audience; which certainly helps with the delivery. That said, it is important to have confidence in what you have written and to trust your judgement. As part of the process, Aiden and Isaac taught themselves about body posture when making a speech, clarity of voice and thought and projection. An excellent experience. Kings would like to thank the organisers for providing this exciting enrichment event for young people.